This entry was posted in Midd Blogosphere and tagged discovery, LIS Staff Interest, search, Summon on February 3, 2012 by Arabella Holzapfel. You can read more about the Campus Map project in this earlier post on the LIS blog. The Add Resource button now works in IE 7. We’re testing out a new spam prevention module on the Ask a Librarian form that block spam bots without annoying actual humans. It does this by adding some hidden fields to the form that trip up automated spammers. If you’d like to have this added to your form, just let us know. Work continues on Summon. Latest links into the Drupal platform include the search widget on the LIS main page (go/lis) where there was previously only a text link, and a proliferation of simple sidebar widgets on the Library pages. SubjectsPlus interface alterations to reflects the change from WebBridge to 360 as our OpenURL link resolver in the Summon implementation. When we launched the new version of our website, we put in place a search strategy that would automatically forward you to a page if we were reasonably sure that the page was where you wanted to end up. For example, if you searched for “academic calendar”, you’d end up on the page with the current year’s academic calendar instead of a search results page. The way we made this work is to automatically forward you to the GO shortcut if your search matched an existing GO shortcut. So, if go/dining exists and you search for “dining” you go to the site that go/dining points at. 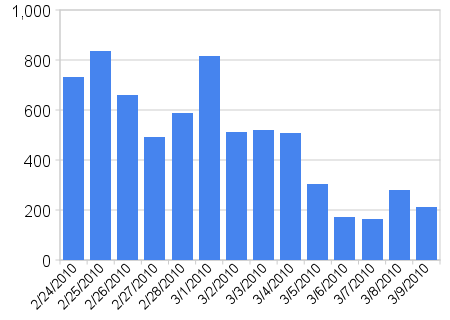 At the time we set this up, the GO database contained around 1,000 entries, mostly redirects to academic departments, offices, programs, or local government or non-profit organizations. 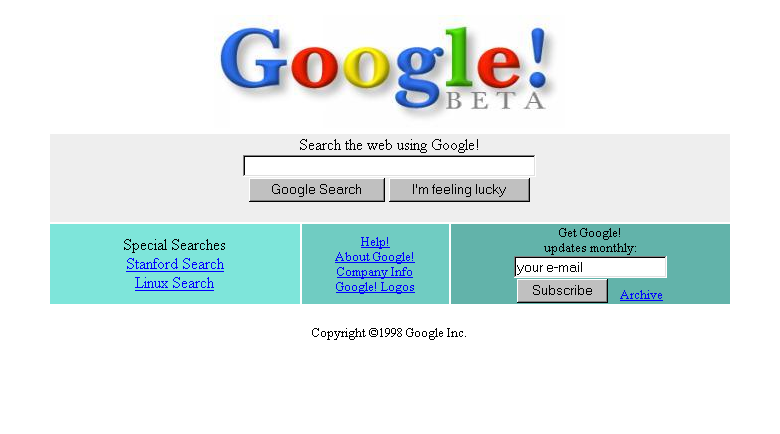 GO was a self-service application at that time, but wasn’t often used by students, faculty and staff to create shortcuts. There are now 4321 GO shortcuts in the database, including aliases. People use it to get the word out about their events (go/justice, go/bachfest), faculty create shortcuts to their course sites (go/chns0475), staff create quick links to advertise new services (go/getoffice), and many other great uses that make us glad this is a self-service application. At the same time, there are now many GO shortcuts that are links to YouTube videos, other colleges, personal websites, and some that are just jokes. 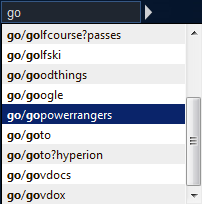 These are, generally, fine to have in the GO database. Even the first version of GO (at the time called the External Redirection Application) in 2005 had a few “easter eggs” that are still there. But because of how our search application interacted with GO, people’s ability to quickly and easily find information on our site was getting hampered by these “un-official” shortcuts. It is something someone might search for (i.e. 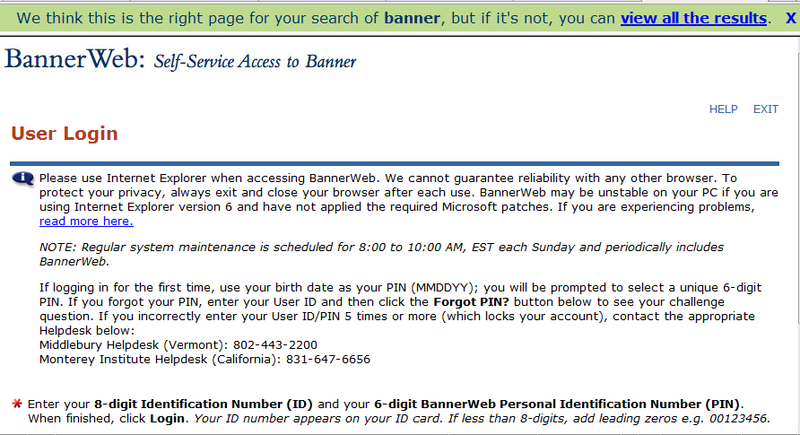 bannerweb, but not bannerweb?ugapp). It goes to a page on our site (i.e. capp, but not campusstorage). There’s really only one page that the person means by that search (i.e. chaplain, but not chicago). New GO shortcuts will initially be excluded from being used in search, but we’ll continue to review the list and change it as needed. We’ll also review statistics from searches on our site to see if new shortcuts need to be created or if we need to make an existing shortcut searchable again. We haven’t deleted any GO shortcuts today. go/bacon, go/engage, and go/oooooal still exist, but if you search for “bacon” you’ll now see more information about Sir Francis than images of meat. You can send a note to go@middlebury.edu if you feel that a code that currently isn’t being used as a search result redirect ought to be. You can also flag GO shortcuts as inappropriate. We’ve added a filter for “GO” to the search results page just below “www.middlebury.edu” on the right. Click on that box to filter your search results to only show pages from go.middlebury.edu. And lastly, a reminder that when you (as a person with a Middlebury account) create shortcuts in GO, or comment on blogs on this site, or edit our wiki, you are bound by the College Handbook policies on Responsible Use of Computing Network Service and Facilities, Anti-Harassment Policy, and any other applicable policies from our Handbook. Though we’ve deleted a couple GO shortcuts in the past for being inappropriate, none have yet been referred to HR, Commons Administration or the Dean of Faculty, but logs are kept on the service and that option is always available. The embedded Flash audio player that you see in IE 7, IE 8, Firefox and Opera now renders correctly and allows you to play the audio file. Many CSS fixes were made to the Translucence theme. This entry was posted in Midd Blogosphere and tagged Drupal, LIS Staff Interest, LIS Website, Middlebury Community Interest, search, Summon on June 17, 2011 by Ian McBride. New! Whether you want books, or newspaper articles, or images, you now can start in just one place. 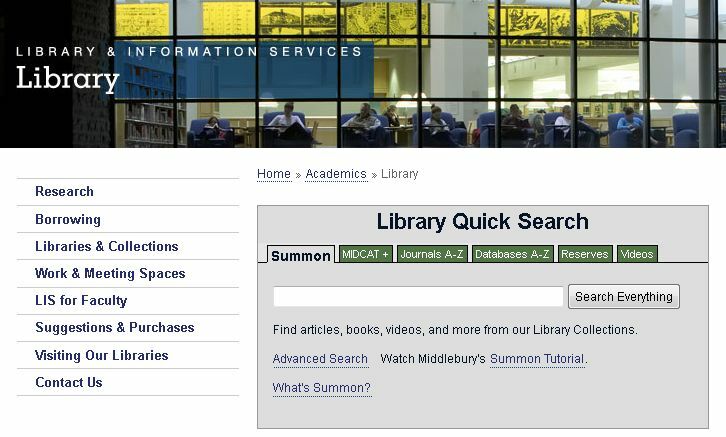 Summon is our newest and most effective tool for searching many resources at once, so we’ve put it right at the center of the library home page (look for the “Summon” tab in the “Library Quick Search” box). Summon searches just about everything we own. Try it out! In a few cases, you’ll still need MIDCAT and other research databases. 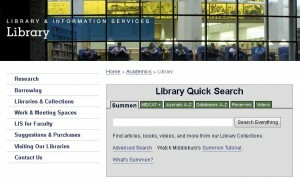 The “Catalogs” tab takes you to MIDCAT, NExpress and WorldCat (and it now has a link to ILLiad for interlibrary loan, too!). We’ve also added a “Databases A-Z” tab to make it easier to get directly to resources like JSTOR and PsycINFO. But remember, Summon searches almost everything so it’ll usually be the best place to start. Read more about Summon here. You’ll find more help documents in Summon, and we’ll be creating a tutorial for it soon. Please send us feedback here, or look for the “Feedback” link in the Summon interface. If feedback is about a particular search result, use the “report an error” link in the “Get it @ Midd” results window. This entry was posted in Midd Blogosphere and tagged Facebook, library, Library Spotlight, LIS Staff Interest, Middlebury Community Interest, Research & Collection Services, search on May 31, 2011 by Carrie Macfarlane.